Learning a new craft can appear daunting, but fear not! 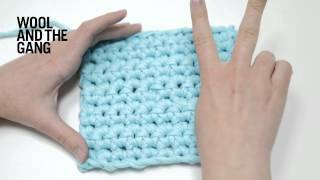 We've put together an introduction to crochet, to give you the idea of the basics to get started. We recommend you checking out our technique specific how to pages to learn how to carry out each technique. Now's the time to get hooked! First lets meet the humble hook, that actually has four zones. First the handle, for you to hold. The shaft which determines the size of the stitch. The point which divides your fabric. Lastly, the groove, which grabs the yarn to make the stitches. OK that was an intro to your crochet hook. Now, hold the yarn in your left hand with the hook in your right and spend some time getting comfortable holding the hook. People tend to hold the hook differently, some hold it like a pen, some like in the example to the left. Try out a few ways to find what works for you! 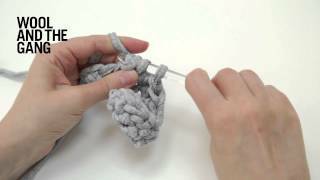 Now a brief introduction to how to actually crochet. 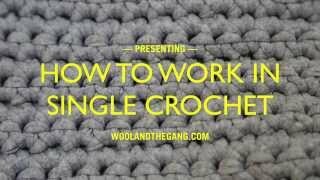 When you crochet you will work across your fabric from right to left. When you get to the end of your row (if crocheting a flat project), you simply turn your work around. One of the most common crochet techniques is single crochet, which produces a tight fabric, example to the left. Double crochet to the left is more open. Once you know how to do the single crochet, it's easy to move on to double crochet. OK so that was our short introduction to crochet. 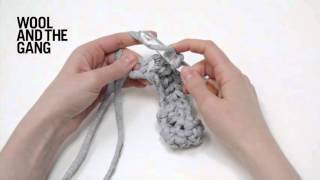 We hope you enjoyed it and that you now feel encouraged to try out a beginner crochet project. There are so many things you can crochet: from baby clothes, bags to cushions and rugs. We offer a whole range of beginner crochet projects, so take a moment to explore, hope you find something you'd like to try out!